Adobe fired back against Steve Jobs and Apple, with an open letter and a new campaign espousing its love of Apple. The battle--which some claim could change the course of the future of the interactive mobile Web is a waste of time, ink, and money for both companies. Ultimately, the market will decide and the Web will evolve regardless of the outcome of the Flash war. 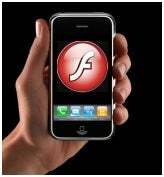 A couple weeks ago, Steve Jobs posted an open letter explaining why he--and by extension Apple--have no intention of allowing Adobe Flash onto the iPhone or iPad platforms. Jobs list included some valid points regarding the full Web experience, security concerns introduced by Adobe software, and the fact that Flash doesn't play well with a touchscreen environment. Jobs issue with the impact on battery life seems legitimate, but also seems like a choice that could--or should--be left to the individual user. The final two points of Jobs letter--that Flash is proprietary rather than open, and that dependence on Flash could put the evolution and development of the iPhone and iPad platforms at the mercy of Adobe seem suspect. Now John Warnock and Chuck Geschke--founders of Adobe--have responded with an open letter of their own. In it, the two state "We believe that consumers should be able to freely access their favorite content and applications, regardless of what computer they have, what browser they like, or what device suits their needs. No company--no matter how big or how creative--should dictate what you can create, how you create it, or what you can experience on the web." I agree with the Adobe founders. I do believe that Apple should loosen its grip, and that--to the extent that it's possible given the unique limitations of different platforms and form factors--my Web experience should be consistent no matter how I get there. However, I don't necessarily agree that Flash is nearly as "necessary" as some have suggested. Really, though, who cares? Apple has a strong smartphone presence with the iPhone, and it owns the nascent tablet market by default with the iPad due to lack of competition (at least so far), but Apple is not the only game in town. As of February, comScore reported that Apple has about 25 percent of the smartphone market in the United States--leaving 75 percent of the market for Adobe to focus its efforts on. Whether its on the iPhone and iPad, smartphones and tablets in general, or the Web as a whole, the market will ultimately decide. Users that want or need Flash will simply not purchase Apple's products, thereby voting with their wallets. User's that have an iPhone or iPad and want Flash will make their voices heard, and if the demand is there Apple will either comply or risking alienating its loyal following. Contrary to the hyperbole, the Flash war is not the end of the world, or even the end of the Web. Bottom line--whether Adobe Flash ever runs on the iPhone or iPad--the Earth will continue to turn and both companies will continue to exist.